This bronze depicts Aprodite (Goddess of love and beauty) lying down holding a scroll and pair of scissors. Alongside her is Artemis (Goddess of the hunt, the moon and archery) holding a spindle. This figure is based on the Ancient Greek sculpture of 'The Fates' by Phidias (480-430BC) and belongs to the Parthenon in Greece, Phidias is generally acknowledged as the greatest Ancient Greek sculptor. 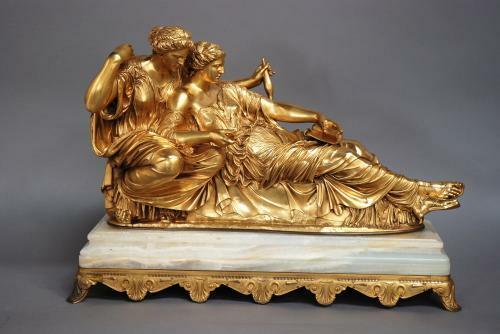 Both figures here are depicted draped in the finest cloth, a technique known as 'wet cloth' (particularly imitated from the works of Phidias) and is supported on a gilt mounted onyx base. Jean-Baptiste Auguste Clesinger was a French sculptor and painter in 19th century and was awarded various honours and awards for his works. This bronze is a reduction cast by the famous Parisian foundry F. Barbedienne, founded in 1838, and bears their signature and also the Collas reduction stamp. The Barbedienne foundry was set up in 1838 by Ferdinand Barbedienne and Achille Collas, Collas invented a machine to create smaller bronze figures from statues of Greek & Roman origin in particular, of which this bronze is an example of. This foundry produced many fine pieces over the years and worked closely with many artists. This bronze is in excellent original condition and can go straight into a home or collection.